At Train Party, we are continuously adding and improving our range of train theme party supplies, favors and cake decoration items to make your event more enjoyable. 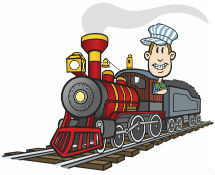 Find here the newest train party products, birthday cake toppers, unique toys and gifts. As always, you can visit our most popular sections such as Train Theme Birthday Party Supplies, Thomas Train Cake Decor, Train Toys & Gifts and Thomas & Friends Merchandise. This section is updated frequently, so please check back soon.